From bracelets to bookmarks, you can make almost anything out of beads. Although some projects require expensive patterns or books, you can also use totally free beading instructions to help you create some wonderful designs. Saving money on patterns allows you to stretch your beading supply budget just a little further. The following projects are completely free, and you can print the instructions to take them with you to your craft table. If you need help downloading the printable instructions, check out these helpful tips. Print the instructions for this bracelet. This bracelet is the perfect accessory to add some sparkle to any outfit, and it's easy to make with tools and supplies from your local craft store. Expect this project to take about an hour or two. Create the raspberry drops first. To do this, take one headpin, and slide a flower bead onto it. 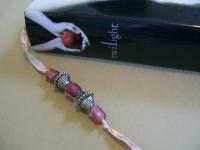 Next, add a raspberry bead. Finally, create a loop for stringing by grasping the wire with your chain nose pliers and wrapping the wire up over the round pliers end and around itself again. Repeat this process with all 18 of the raspberry glass beads. Then make the teardrops. Start by cutting a length of jewelry wire about four inches long. Make a loop on one end of the wire as you did with the headpin in step 1. Then slide the teardrop bead onto the wire, positioning it a little away from the looped end. Bend the wire to follow the point of the bead. Bring the other end of the wire up to the loop, and wrap it around the wire to secure it. Repeat with the remaining teardrop beads. Measure out a length of stringing materials that fits loosely around your wrist. Add a few extra inches to be safe. Using the crimping pliers and crimp beads, attach one part of the clasp to one end of the string. Trim off any excess material. Thread four small silver ball beads onto the wire, burying the loose end of the string material as much as possible. Slide one of the raspberry drops onto the string, and then follow with two more small round beads. Add another raspberry drop, then two round beads, then a clear teardrop. Add two more round beads and another raspberry drop, then two more round beads and another raspberry drop again. Add two more round beads and a rhinestone bead. Repeat this pattern until you use up all your beads and the bracelet is a comfortable length. 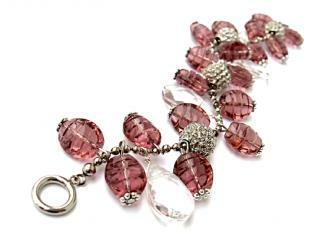 Add another crimp bead and the other end of your clasp, and use the crimping pliers to finish the bracelet. Trim off any excess stringing material. Print the instructions for this ring. While necklaces and bracelets are among the most popular beaded jewelry projects, you aren't limited to adorning the wrist or neck. 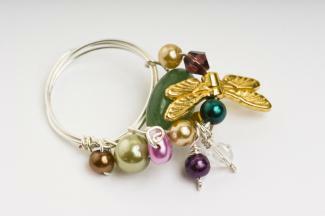 You can also make adorable fashion rings using beads and wire. This project should take less than an hour. Wrap the piece of string around your finger, and cut it so that it fits comfortably. Be sure you make it large enough to get it over your knuckle. Measure the length of the string. This is the circumference of your finger. Divide this number by 3.14 to get the diameter, and purchase a small piece of dowel that matches this number. Alternatively, you can bring the string with you to the store when you buy the dowel. For reference, a two-inch finger circumference would need a 5/8-inch dowel. Hold the dowel tightly, and wrap the wire around it several times. You can make it as wide as you like, but four times around makes a nice, sturdy ring. Leaving a long tail on the end, cut the wire. Wrap the tail a few times around the ring to secure the other end of the wire. Next, begin stringing beads and charms on the ring. Add several beads, and then bring the tail back to the ring shank and wrap it again. Add more beads, and secure the tail again to the ring shank. You can finish the raw end of the tail by creating a spiral. Print the beaded candle decoration instructions. Beading isn't just for jewelry. 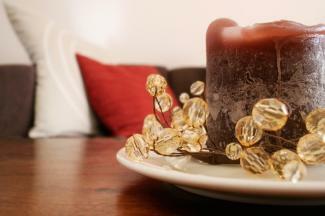 In fact, you create lovely home decor items using beads and wire. This freeform candle decoration makes a great gift and takes about an hour to complete. Begin by wrapping the wire around and around the paper towel tube to create a base. Slide the base off the tube, and then loop the wire around it multiple times to secure it. Cut the wire, leaving a long tail. You can always add more wire to this project, so don't worry about measuring. String one glass bead on the wire, and then twist the wire back on itself. Loop the wire around the base again. Repeat step 3, creating beaded sections of varying length. Go all the way around the base, adding more pieces of wire as needed. When you've added as many beads as you like, bend the beaded sections to give them a random, natural look. Place the base on top of a plate and top with a candle. If you're looking for more ideas, the following slideshows offer great step-by-step instructions. Try something new! Although making beaded jewelry is definitely fun, sometimes you want to branch out and try other types of crafting projects. Beaded bookmarks are a simple craft that allows you to make use of all the leftover beads you've saved from your other jewelry making projects. They also make great gifts for family, friends, teachers, coworkers, and other special people. This fast and easy craft, which should take about half an hour, is a great way to get started beading with kids too. If you're on a tight budget, you know how important it is to find creative ways to save money on your craft projects. To save money on beads, you can try looking for sales or coupons at your favorite stores and cutting apart thrift store costume jewelry to design your own creations. Another great idea is make your own beads. It's actually quite easy to make your own beads from patterned scrapbooking paper, wrapping paper, or pages cut from old magazines. What's more, your designs will be one of a kind. Do you have some old jewelry you love but never wear? 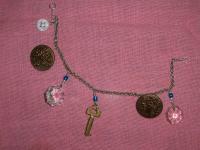 You can combine it with buttons, crystals, loose beads, and other found objects to create unique works of wearable art. If you have some wire-wrapping experience, you'll find this project easy and fun. Even if you're new to beading, the step-by-step instructions will walk you through the process of creating this beautiful piece of jewelry. Expect this project to take about an hour. There's no reason to pay for patterns or designs when there are so many great free beading projects out there. Choose a project that best meets your needs and experience level, and get ready to explore this incredible craft.